Discussion in 'General Discussion' started by Renato Simioni, Mar 28, 2019. When will it be unlocked for Reiza backers? Can't wait to drive them all!!! it should be in your inventory for rf2. Yeah, now it's downloading them. I guess I read the thread so fast, I went to rF2 but nothing showed up. I looked up to the shop and it still showed up to buy it. But I completely closed Steam, went to rF2 again and 10 new items are downloading, the first of them being Imola. Formula Vee, here I go! Looks great! Hopefully it will go on sale sometime soon. Don't take me wrong, all kudos to you guys from Reiza & S397 for such great work but buying a DLC pack that costs more than the base game is out of the question for me and probably for other Brazilian players as well due to the way prices work for these in-game items. Same goes for other DLC packs like Endurance & GT3, each pack is more expensive than the base game. The kerbs on the tracks don't seem to trigger the sound and ffb rumble the way that most Rfactor2 tracks do. In the MR18 the surround texture for the side windows is transparent to certain track materials? I noticed this with the kerbing on Imola. Also I would say the interior sounds in general are too quiet, although Rfactor2 sounds are all over the place even in Studio397 content, maybe Reiza has done the best they could. But the tyre scrub sound for the rears on the PUMA GTE doesn't sound right at all. It's almost like a theremin sample or something. It's most noticeable after a corner when straightening out the car again. In the car garage menu, the steering lock on most Rfactor2 cars show the degrees of rotation for the steering wheel, and then the max steering angle in parentheses like below, whereas the Reiza cars only show the steering angle. And in the notes section of the garage menu for cars with no pit limiter it usually shows a hint for the pit speed. This would be very helpful on the Formula Vee. The physics is fantastic, you've done a great job on the cars and I absolutely love the little details on the tracks with the spectator cars driving around and crossing the bridge during the session, and the drones that fly around. Maybe this last thing isn't a bug per se but the car liveries/skins on the Puma GTE seem a bit too saturated or vibrant compared to the other cars. That might just be a useless personal opinion though. I'm also a REIZA Backers .. but i dont have get the DLC in rfactor2 !? Please see the pinned thread in the Reiza51 forum. 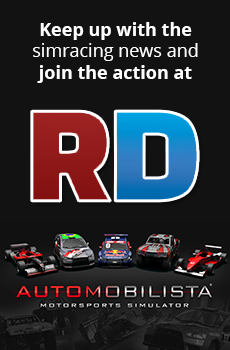 Hello, the new content for rfactor 2 is not for those who bought all AMS content? Great pack, Reiza! Thank you for making it for us. Thank you Reiza for the pack! Bought without hesitation and will spend some quality time with these cars and tracks. For people finding the price a bit steep, keep in mind that Steam get its cut as well as Studio 397. And this great content did not magically made itself out of thin air. So I encourage anyone wanting to support Reiza to buy it (including those who can get it for free). I do not know anymore, I am REIZA since its beginning, I bought all their games and contents from the beginning. But I guess yes since I have access to the beta of AMS on my steam account. I bought AMS + season pass on Steam and have access to AMS beta & Reiza 51. Does that mean I can get the rF2 bundle for free? I'm pretty sure you needed to buy from here on the forum ! Interesting thing. I like cars steering more with slightly off steering degrees. I felt that if game and wheel profiler degs were 1:1, then cars feels too direct to me, not enough pneumatic at tires. Great with 1:1, but with an error of few percent feels somehow more natural in my mind. Some graphics things. Though I think everything is great. There are few things I'd like to mention. As i drove in historic Imola I thought that shadows are too dar, ambient color too dark ? other rF2 thing ? Absolutely love VIR, I think it is best looking. Very good track. But I thought that tarmac specular maps are a bit dull when going to T1. At Imola I thought that tarmac lacks visual features. Is Puma P052 using the clutch, it was weird at first, but when I started using clutch and heel and toe, it became very awesome. 1st thing: I'm very impressed by how all the cars feel and the tracks look great as well. - I disabled everything that might cause any head/cockpit movement in the rF2 options: No lock to horizon, no head physics etc., but i still get some cockpit movement on bumpy track surfaces. I tested it with some of the official Studio 397 cars on the Reiza tracks, they don't do that. Not sure what's causing it, it doesn't happen with any other content, just the Reiza cars. Otherwise i really like all the content so far. Driving feels awesome! Tracks are incredible, at least Guapore, VIR and 2018 Imola so far looksl ike top content there was in rF2 yet. I also drove tracks in the rain, heavy rain, to dry... And it looks fantastic... very good utilisation of rF2 engine has been made. Some times as i drove through 2018 wet Imola as it was raining, and later just as rain stopped, the track looked almost real. I got some of GranTurismo Sport visual vibes. Amazing. Puddles in Guapore are very intense, looks amazing, but no aquaplaning or any features of puddles physics and sounds starts running in the mind, but it is ofcourse just a wish, not an issue. Also as I drove Guapore i saw all the puddles, but honestly thought that physical mesh of the road is not matching that well. I know thats just cosmetic, not an issue, just an rF2 wish again... but also I suppose that track is simply too flat in terms of macro undulations. Liked driving in the rain a lot, it is fantastic and I love to use this feature of rF2. I thought that cars may be too good with longitudinal traction in the wet, and doing a bit too fast laptimes, didn't felt very much slower.